Halton Borough Council’s Health Improvements team ran a health day for staff at the Runcorn Arriva depot using Arriva’s health bus. with 40 drivers and other staff members being given health checks..
During the day health trainers from the HIT Officers offered a range of checks including blood pressure checks, lung age checks and full NHS Health Checks, as well as advice on healthy living, stopping smoking, getting more active and losing weight. • 17 Lung Age Checks resulted in one referral to our Stop Smoking Service and two referred to their GP for further tests. • Five general NHS Health Checks. The full NHS Health Check takes 30 minutes and as well as checking BP it also tests cholesterol and blood sugar levels. It’s available to people aged 40-74 who have not already been diagnosed with any health conditions including high blood pressure, diabetes, kidney disease, heart disease or stroke. Speak to your GP if you think you are eligible or want to know more. 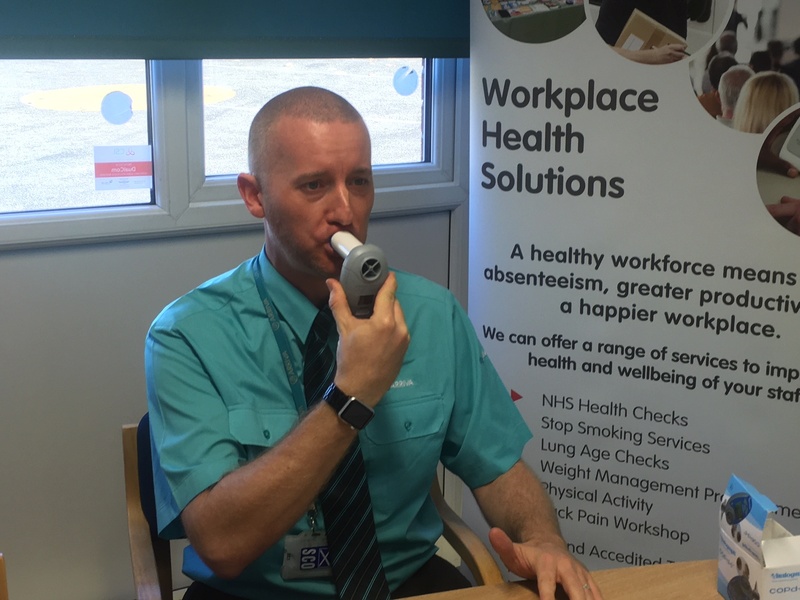 Operations Manager for Arriva Runcorn, John Farrugia, said: “I’m delighted to partner with the Health Improvement Team to offer these health checks to our staff on site here. Shift patters means many of them would find it hard to get to their GP for a simple check-up. Halton Borough Council’s Executive Board Member for Health and Wellbeing, Cllr Marie Wright, said: “We know that there are potentially 13,000 people in Halton with undiagnosed high blood pressure and have no idea and many of these will be shift workers like here at Arriva making it hard for them to get to a GP or other health venue for a check-up. The Health Improvement Team’s workplace solutions include events and training in areas including mental health awareness, cancer awareness, health champion training and on-site delivery of services such as weight management, stop smoking sessions and physical activity. For more details call 0300 029 0029 or email hit@halton.gov.uk. Sylvia is adult placement hero!